Please join us on Tuesday, 1st December for a meet the winemaker dinner at Maray in Liverpool. Not only will you meet the winemaker of Carramimbre but you’ll also get the chance to sample the wines, paired perfectly will select dish of the Maray menu. Ever since the very first vines were planted, Nyetimber has had one single aim: to make the finest English sparkling wine there is. Nyetimber owns one hundred percent of their vineyards and all wines are produced using grapes from the hectares they have planted in West Sussex and Hampshire. The southern climate allows the grapes to slowly ripen, achieving optimum levels of acidity, complexity and finesse. Over the years, they have developed into one of the leading lights in the English wine industry, and continue to grow from strength to strength. Please join us on Thursday, 26th November for an evening with Angus Hunter, Account Manager at Nyetimber. Pierde Almas is an artisan-made, small-batch mezcal produced in the southern Mexican state of Oaxaca from 100% naturally fermented agave. 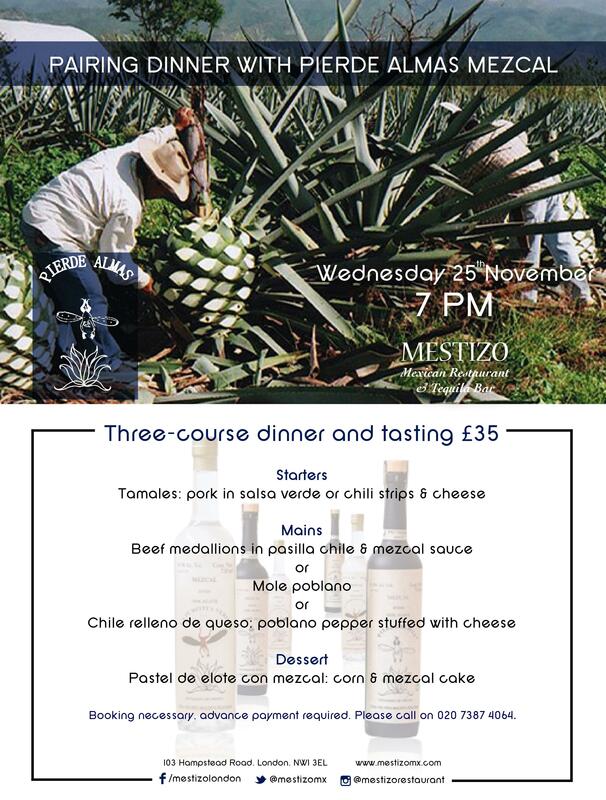 On Wednesday, 25th November, Mestizo will be hosting a Pierde Almas dinner, pairing the different varieties of mezcal with a carefully prepared menu created by their chef. Pierde Almas is also Mestizo’s Drink of the Month, throughout September they’ll be serving up all kinds of cocktails with Pierde Almas mezcal as the main ingredient. Yum! 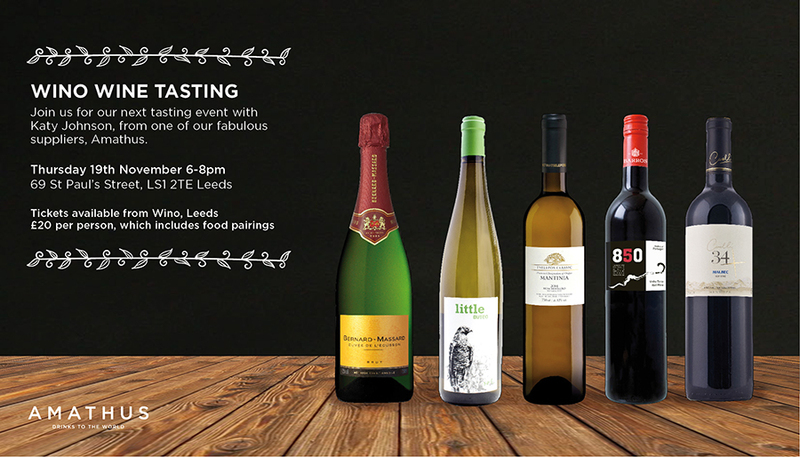 Please join our very own, Katy Johnson next Thursday for a wine tasting and food pairing at Wino in Leeds. Price per person is £20 which includes your wine and food for the night. If you’re interested in booking, please call Wino directly on 0113 3455960. Manchester are you ready for the Ti’Punch Cup final that is coming your way? 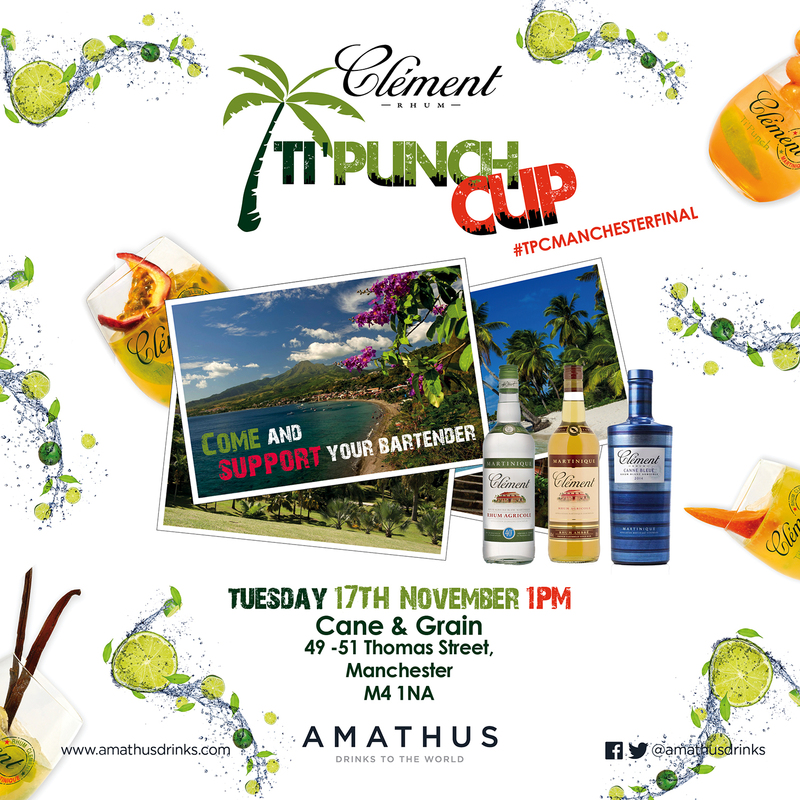 To show your support get yourself down to Cane & Grain on the 17th November, to see your favourite bartenders battling it out for a trip to Martinique, home of Rhum Clément. Trust me when I say, it’s not to be missed! On Saturday, 14th November we’ll be welcoming Tony Conigliaro, proprietor of London’s 69 Colebrooke Row into our Soho store for an exclusive tasting of one of his new products, a pre-made Classic Negroni. A Negroni is made up of 3 key ingredients Gin, Vermouth and Bitters. It’s simple to make, packed full of flavour and brings your taste buds to life. For those of you with no lab above your bar, this pre-made Classic Negroni is a simple solution to Negroni perfection! 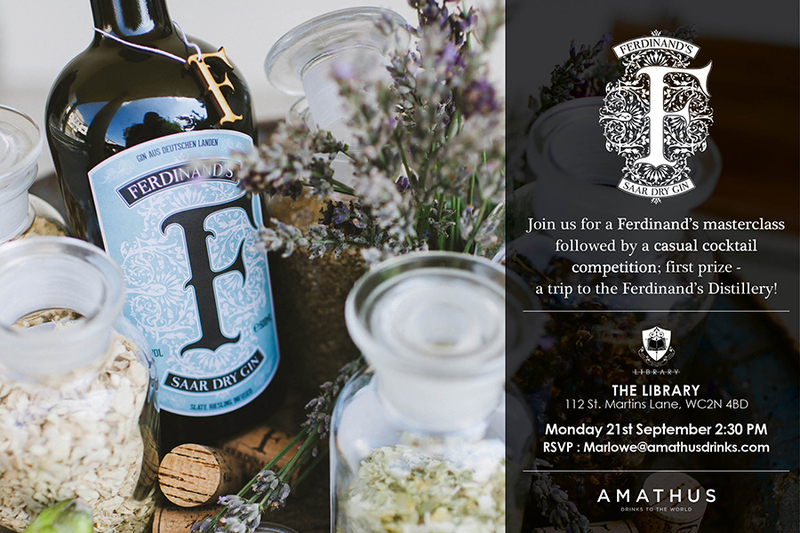 Please RSVP to soho@amathusdrinks.com and reserve your place now. Anthony Wills established Kilchoman distillery in 2005. Located on the west coast of Islay, Kilchoman’s is one of the smallest distilleries in Scotland. To celebrate their 10th year anniversary, Anthony Wills’s three sons, George, James and Peter, have decided to hit the road again for another European/UK tasting tour. With the UK set to be the next stop, we’ve been lucky enough to be chosen as one of only two London venues hosting a Kilchoman’s tasting. 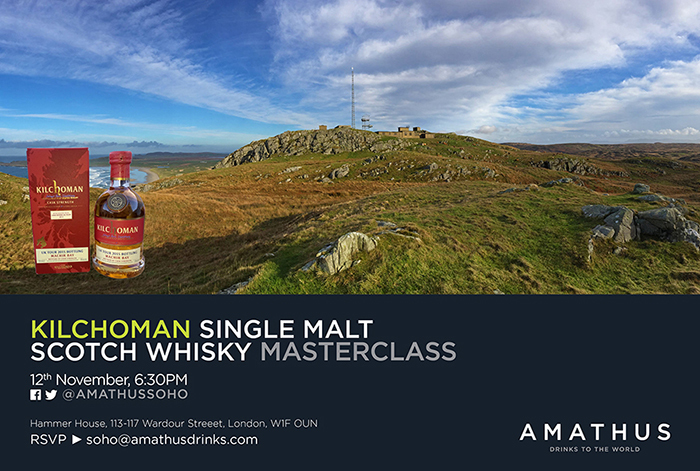 So please join us, this Thursday, at Amathus Soho to sample Kilchoman’s limited edition Madeira cask finish, vintage 2007 and special cask strength. 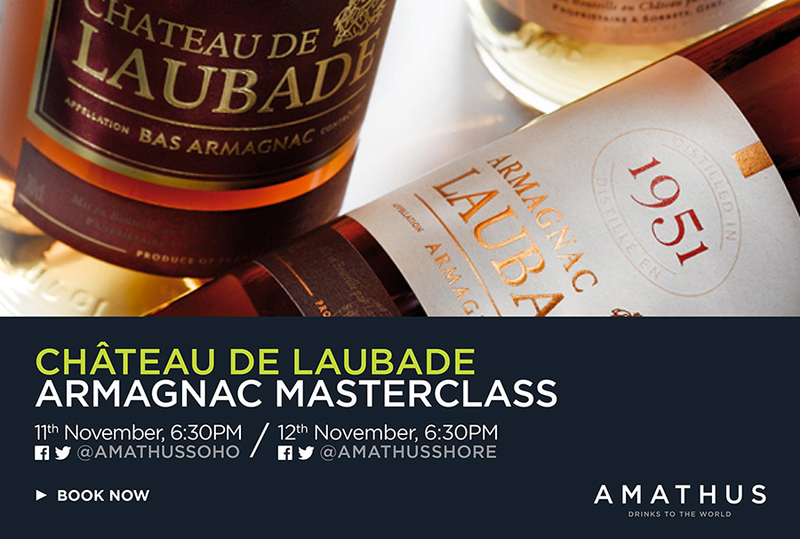 Join us for Château de Laubade masterclasses at Soho, 11th November 6:30pm and Shoreditch, 12th November 6:30pm, hosted by Denis Lesgourgues. Château de Laubade was founded in 1870 and is located in the heart of the Bas Armagnac region. The Lesgourgues family have been running the estate since Maurice Lesgourgues took over Château de Laubade in 1974. Today the estate is run by third generation brothers, Arnaud and Denis Lesgourgues, who follow their grandfather’s tradition to uphold Château de Laubade’s reputation as the leading and most awarded Armagnac brand. Tony Blackburn is back for another year to host the BBC London Soul Night Out at Koko’s in Camden.This year it will be taking place on Wednesday, 10th November, with live performances from Shaun Escoffery, Lemar, Diane Shaw, Jaki Graham, Kenny Thomas, Odyssey and The Three Degrees. For the second year running we will be offering our support and sponsoring the event in association with Children in Need. 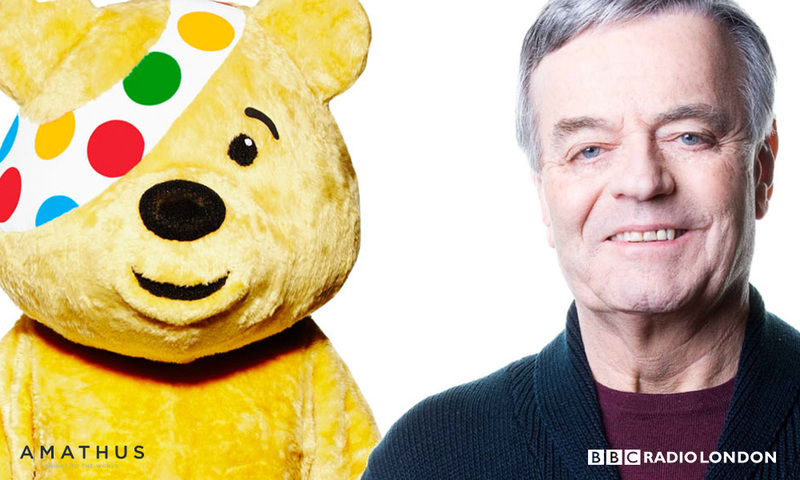 We’re honoured to be able to support BBC Children in Need, a magnificent cause helping disadvantaged children and young people across the UK. Unfortunately, tickets for the event are now sold out. For all the highlights tune in to BBC Radio London from Wednesday, 10th November. 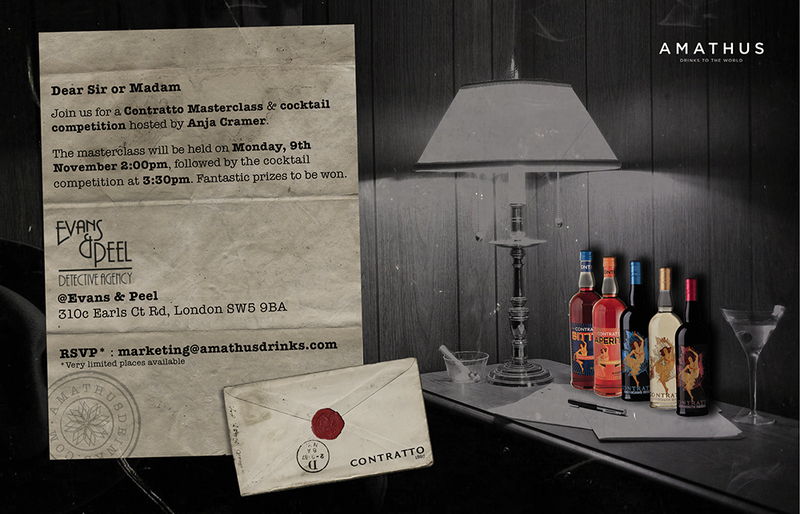 On Monday the 9th November, we’ll be taking over Evans and Peel for a Contratto masterclass and cocktail competition, you’ll never forget. 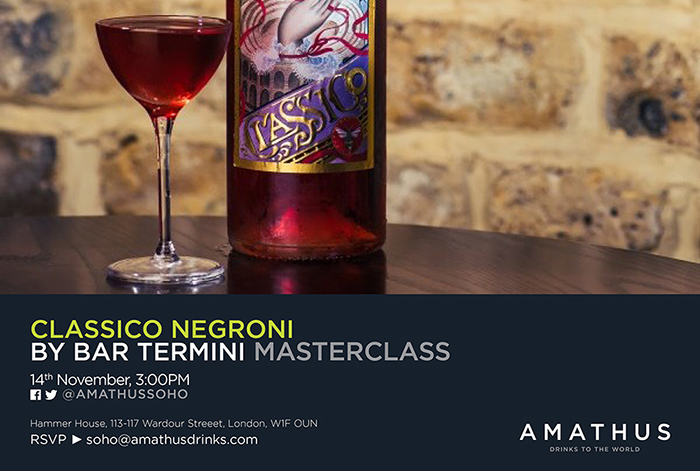 The masterclass, hosted by Anja Cramer, will kick start at 2.00 pm giving everyone the chance to sample her range of vermouths and liqueurs before the cocktail competition at 3.30 pm. Bartenders will need to come up with cocktails on the spot using products from the Contratto range. The lucky winner will win a trip to the Contratto winery in Italy and runners-up will receive other great prizes from the Contratto collection. Let the battle of cocktails commence! 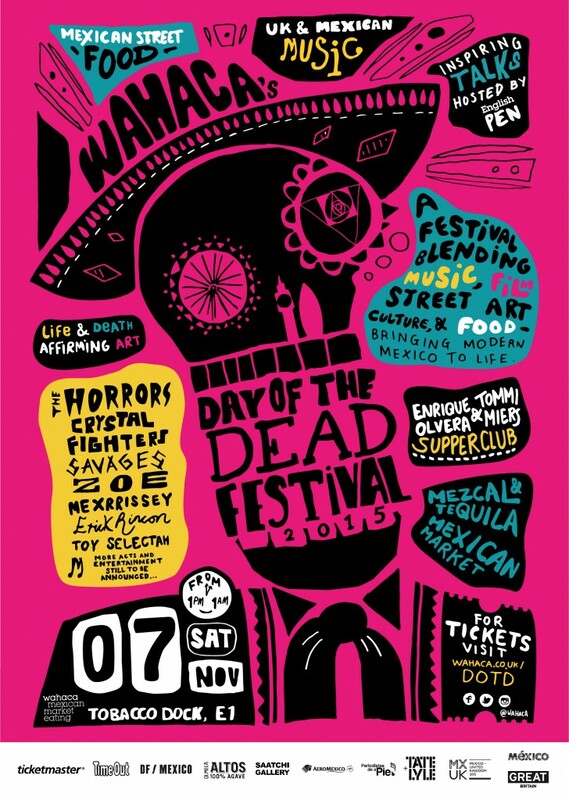 This Saturday, 7th November, is Wahaca’s Day of the Dead Festival at Tobacco Dock, bringing Mexico’s finest food, drink, music and art together, in one place, for 12 whole hours. We’ve decked out our very own underground Mezcaloteca.Whether you like your mezcal straight up or in a cocktail, come by, were catering for all! On top of this we’ll also be hosting mezcal masterclasses featuring Del Maguey, Los Danzantes, Alipus, Pierde Almas and Los Siete Misterio, so swing by our Mezcalteca and join in the fun! Get ready..Tequila Season has arrived! 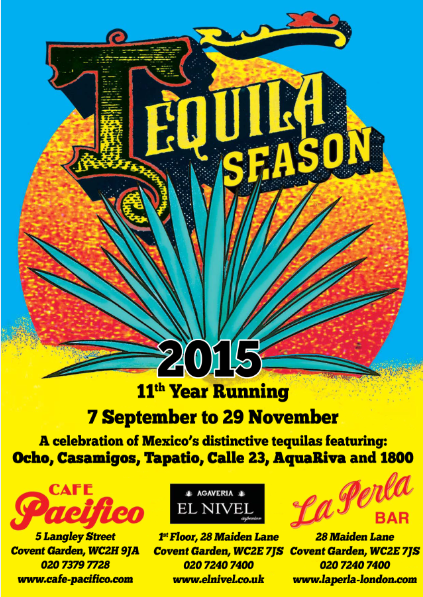 For the 11th year running its time to celebrate Mexico’s finest tequilas and here’s how. From September to November our favourite Mexican restaurant group Cafe Pacifico, La Perla Bar and Grill, El Nivel, will once again be welcoming tequila aficionados and tequila novices into their bars to sample a wide range of tequilas. Each tequila on tasting will be allowed 2 weeks in the spotlight. So joining in on the action is our very own Calle 23 Tequila. 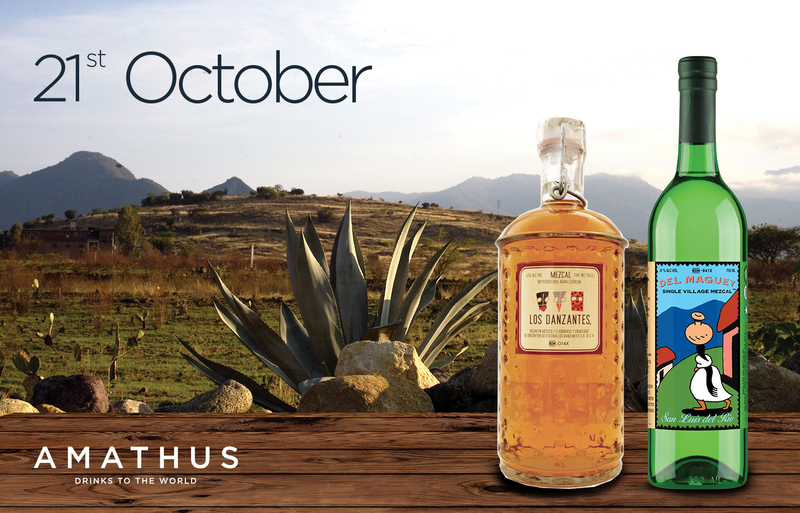 Pop by one of the restaurants and sample this wonderful tequila from the 20th October until the 2nd November. 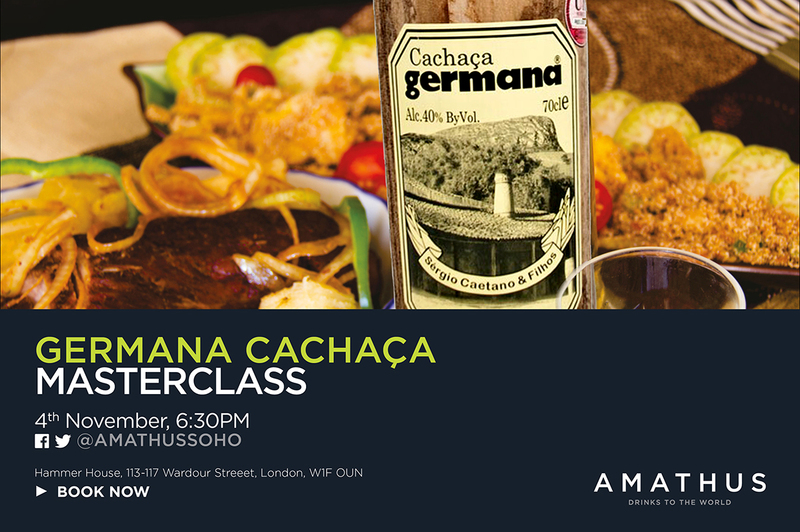 We’ll also be hosting a Germana Cachaça masterclass on the 4th November at our Soho store.This will be a rare opportunity for you to meet the owner of Germana Cachaça, taste the products and delve into how they’re made. Germana is one of the most famous cachaças in Brazil. The Germana recipe stems from a family tradition that began with the family’s patriarch, Sergio Caetano. Since then, the secrets and cares of its distillation have been passed down from generation to generation. 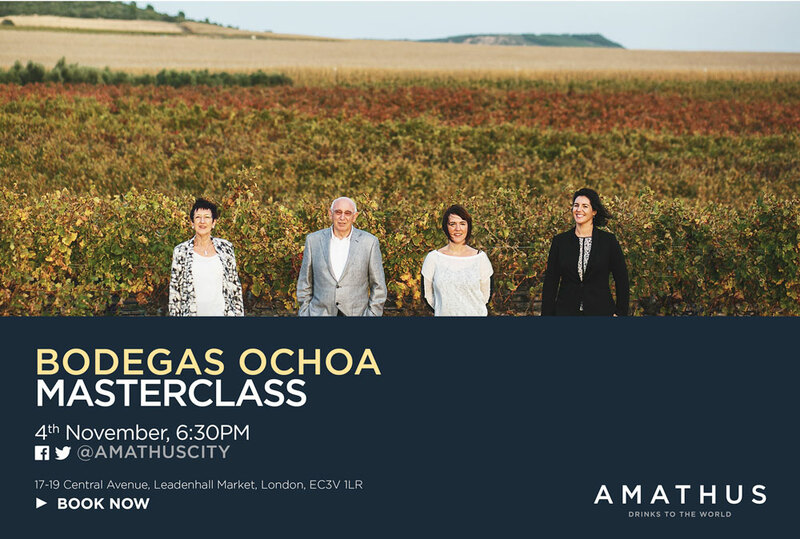 We invite you to join us on Wednesday, 4th November, for a Bodegas Ochoa masterclass hosted by Beatriz Ochoa at our City store. Bodegas Ochoa was founded in 1845 and fast became one of Navarra’s most celebrated producers. Today, the Ochoa family tradition continues at the winery which is now run by the fifth and sixth generations of the Ochoa family. Javier Ochoa and his two daughters, Adriana and Beatriz, produce wines from a diverse range of different grape varieties including Tempranillo, Grenache, Cabernet Sauvignon and Merlot. 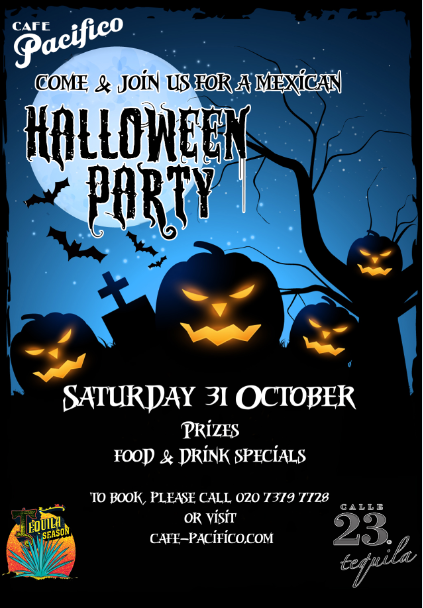 Get your costumes at the ready for a Halloween extravaganza this Saturday at Cafe Pacifico. Calle 23 will be there bringing you some of the greatest tequila around! Ariba! For more information and to book your tickets, please click here. 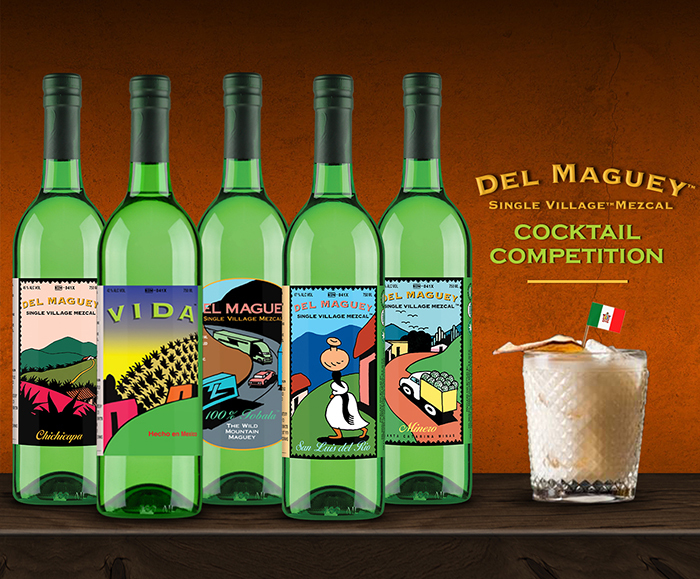 On Monday 26th October, we will be helping host the 2015 Del Maguey cocktail competition final at Wahacca, Charlotte Street. The competition kick starts at 4.30pm so if you’re in the area drop by to see your favourite bartenders battle it out for a chance to win a trip to Mexico. Please join us for an evening with Renato Guerra, who will be presenting his range of Inu and Anane Chilean wines. 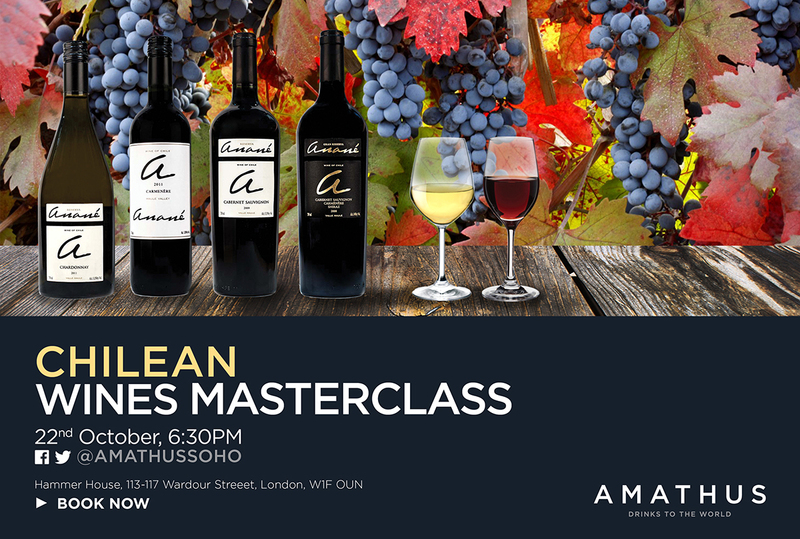 The masterclass will take place at our Soho store on Thursday 22nd October at 6.30pm. Three generations of the Guerra family have been making wine in Chile’s Maule Valley for over 100 years. The wines are currently made by third generation Renato Guerra and his father who in turn, inherited the vineyards from his grandfather. The vineyards are located along the banks of the Maule River between the Andes Mountains and the Pacific Ocean. Limited spaces available so please book your tickets here. Next Wednesday is National Mezcal Day, celebrate with the great selection of mezcal that we have available. Choose from our exclusive brands, including Del Maguey, Los Danzantes and Los Siete Misterios. With less than a week to go, National Calvados Week is fast approaching. To help you celebrate we’ve decided to make you an offer you simply can’t refuse. 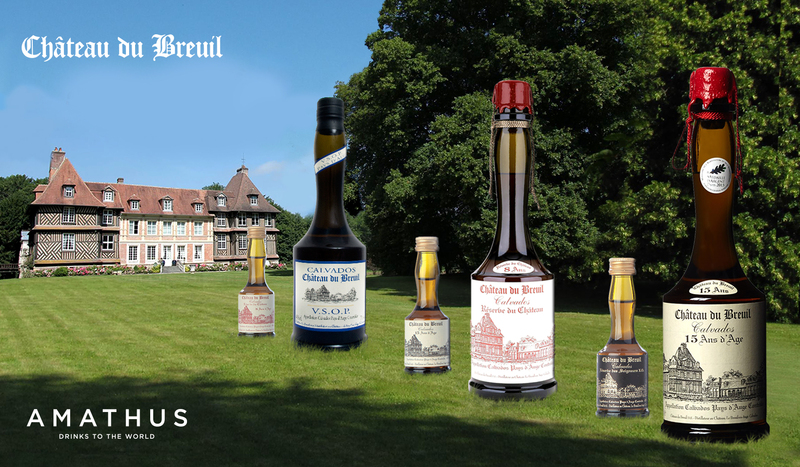 From Sunday, the 18th of October, for 1 week only, we’ll be giving away free miniatures with every bottle of Château du Breuil you buy. If getting a free miniature isn’t enough, we’re making sure that each one is an older edition to the bottle you buy. What’s even better, the offer is available in store and online too. For more information, just visit our website or pop into one of our stores. 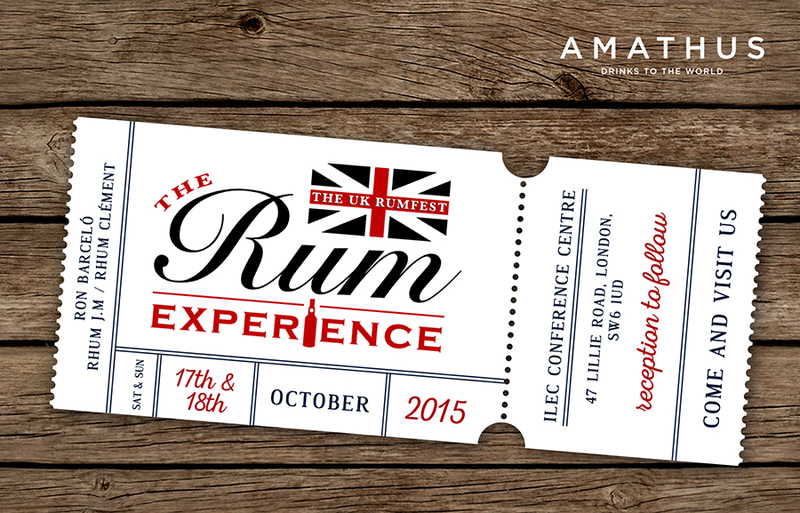 From the 17th October to the 18th October the ILEC centre will become home to RumFest 2015. RumFest is the world’s largest rum festival that brings trade and consumer experts from the rum industry together for a weekend of great food, a range of seminars and entertainment and most importantly the finest rum around. We will be joining in on the RumFest action with Ron Barceló and Rhum JM offering tastings and holding Rhum JM seminars throughout the weekend. 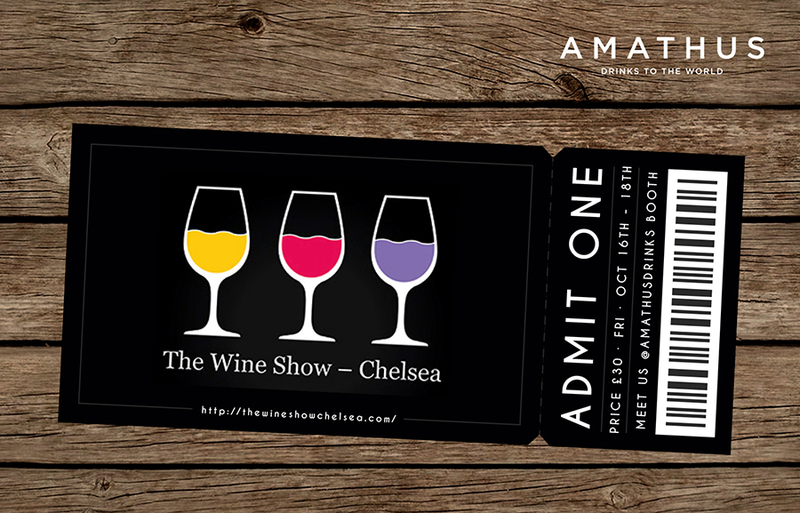 Chelsea Wine Show brings together award-winning wines from around the world from Friday, 16th October until Sunday, 18th October 2015. The show will take place at Chelsea Old Town Hall, Kings Road, London. Over the 3 days we will be showcasing some of our fantastic agency wines we have available. These include Fess Parker, Bernard-Massard, Cálem, Werner and many more. Join us for an evening with Rodolfo Cantarutti to explore the rare and fascinating wines of Friuli. The masterclass will be hosted on Wednesday 14th October at our Shoreditch Store, 303 Old Street. The Cantarutti estate was founded in the late 1960’s by Alfieri Cantarutti who focuses on producing wines from a number of different red and white grape varieties which are native to the Friuli region of Italy. 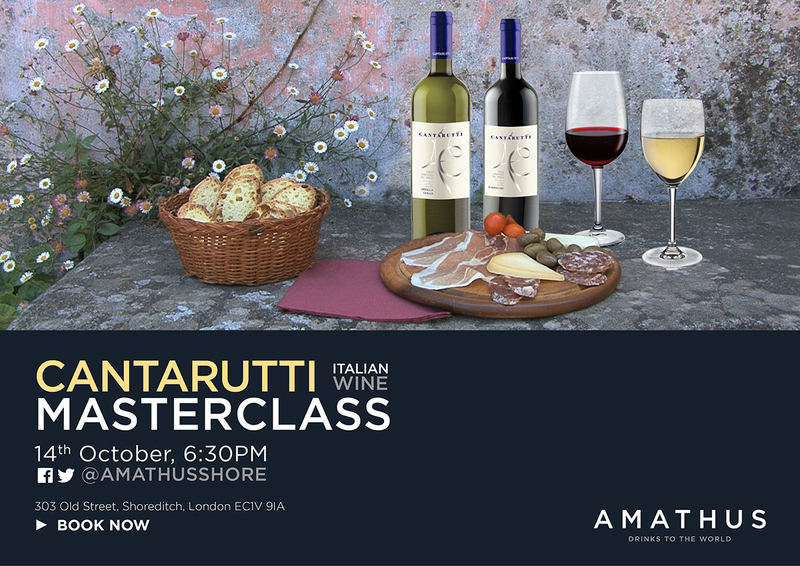 To book your places, please email shoreditch@amathusdirnks.com or call 0207 729 2111. 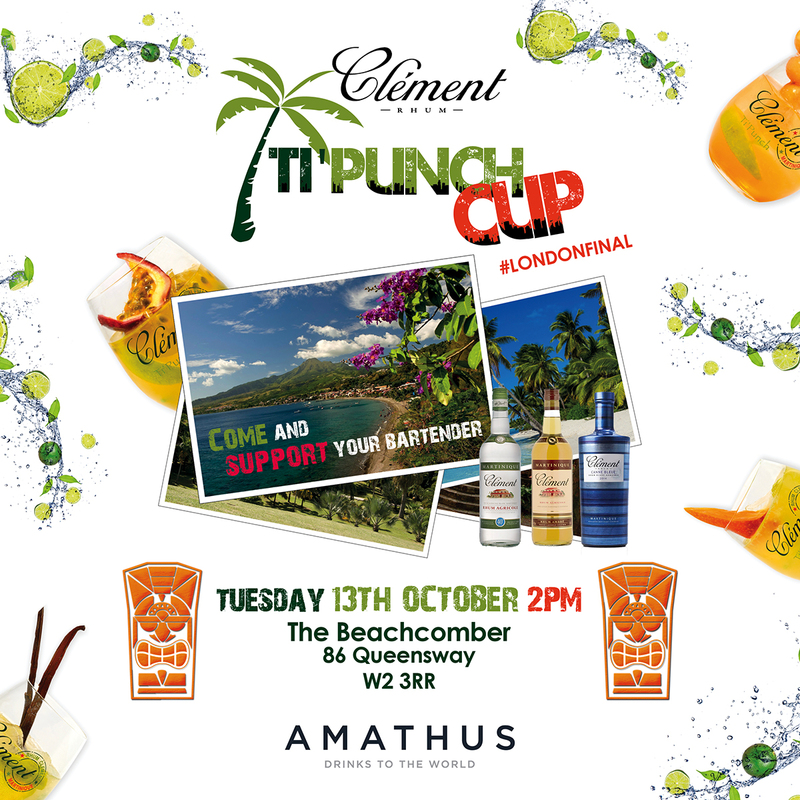 Come and support your favourite bartenders at the 2015 London Ti’Punch Cup final. The final will take place on Tuesday, 13th October at The Beachcomber, Queensway. 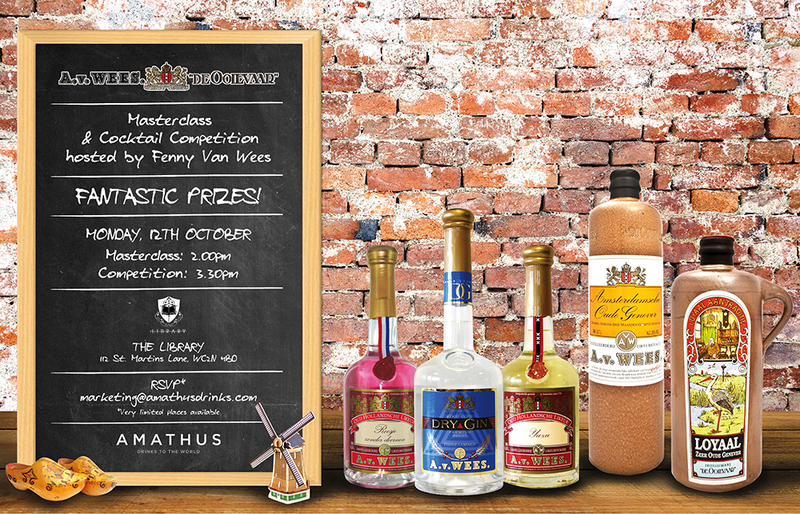 Please join us on Monday the 12th October at The Library, Martins Lane for a Van Wees masterclass and cocktail competition hosted by Fenny Van Wees. Don’t miss out as there’s some fantastic prizes to be won. 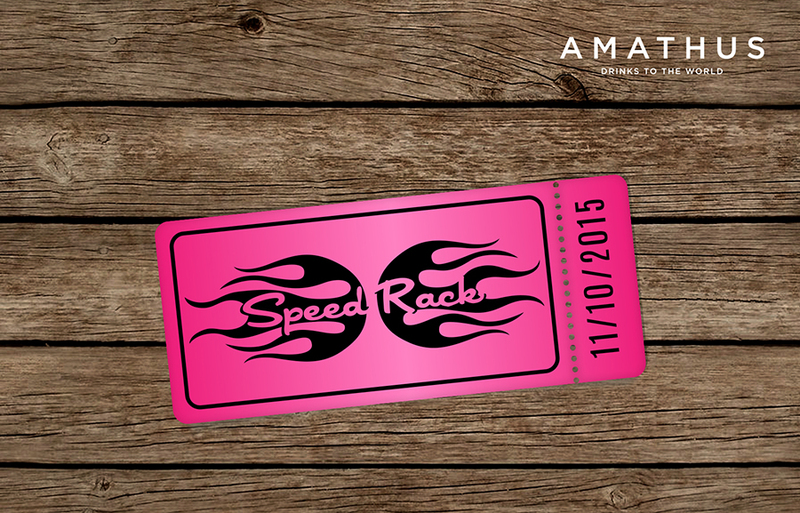 Speed Rack is a speed bartending competition which works at showcasing female mixologists around the country. It was founded in 2011 by Ivy Mix and Lynnette Marrero. The event raises money for breast cancer research, education and prevention. In 3 years across the US, Canada and UK, Speed Rack has raised over $300,000 for breast cancer charities. Del Maguey is a proud sponsor of the event and we will be joining them from 2 pm until 6 pm at Old Spitalfields Market offering a complimentary tasting to everyone watching or taking part. 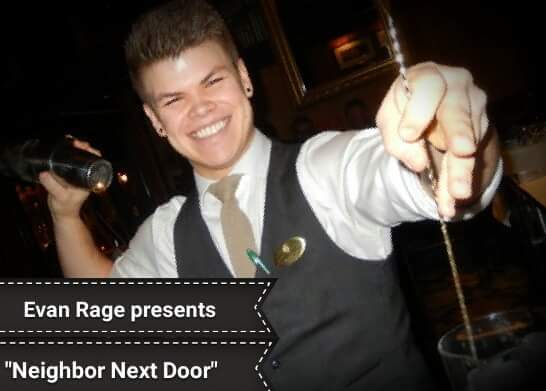 This Saturday Evan Rage (former London Cocktail Club team member) presents to you Neighbor Next Door. Instead of being your regular bar hopper at London Cocktail Week, this year Evan has decided to set up his very own pop-up bar at London Cocktail Club, Islington. To get those taste buds tingling, he will be serving up all kinds of cocktails, including Nordic Penicillin, Sea Merchant, Norwegian Choc-kick and Moves like Ragey. All of which combine Norwegian Linie Aquavit with a range of other goodies. On top of that he’ll also be shaking up Cinnamon Smoked Old Fashioned’s and Orange Tango’s. All this will be available for just £9 a cocktail. So come on down to LCC Islington this Saturday night and be ready for some LCC banter and the best cocktails around. 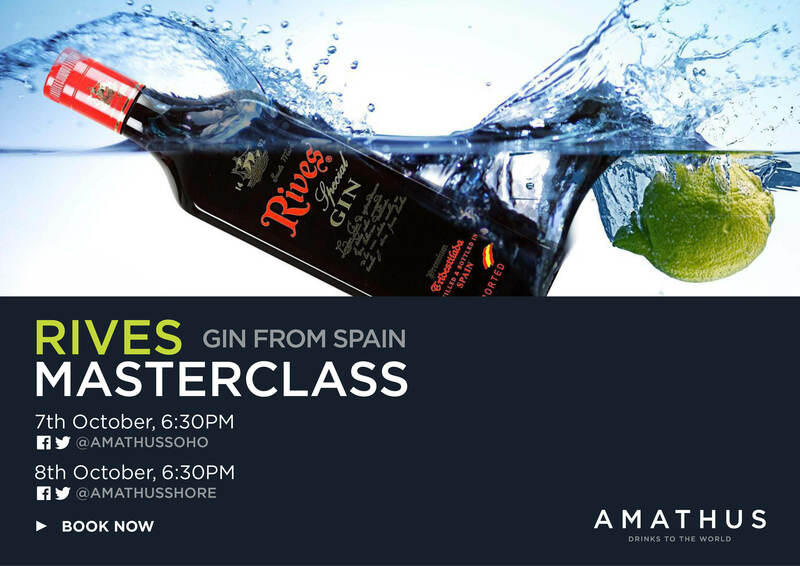 The Rives Gin masterclasses will be hosted by Felipe Toro and will take place at Soho and Shoreditch stores on the 7th & 8th October. We will also be hosting a pod-tasting at our City store on 8th October from 12pm onwards. Limited spaces available so please book your places now. Rives is a Spanish owned family business that was founded by Mr. Augusto Haupold in 1880. The company specialises in the production of exceptional gins using traditional production processes. The company is located in El Puerto de Santa María and boasts one of the most advanced distilleries in Europe. 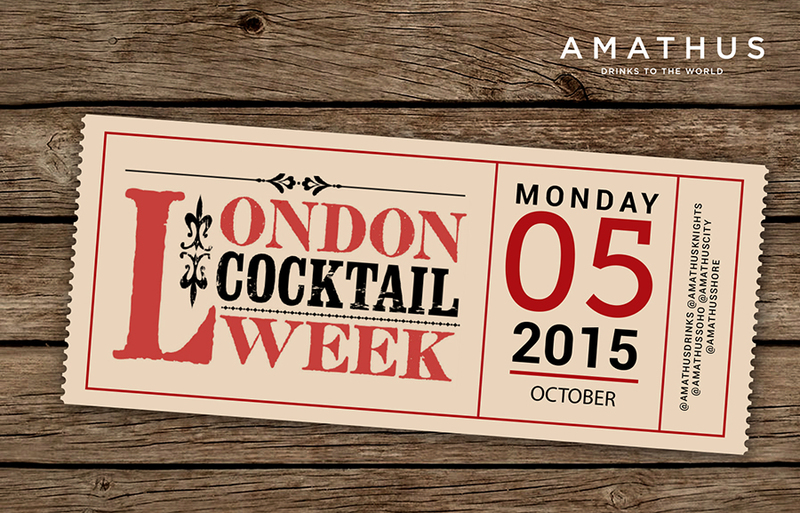 This is definitely one we’ve all been waiting for.. London Cocktail Week starting on Monday the 5th October. Stay tuned as more information of what we’ll be getting up to during London Cocktail Week is coming soon. In the meantime, why not visit their website. Following National Stout Day is National Vodka Day on the 4th October. 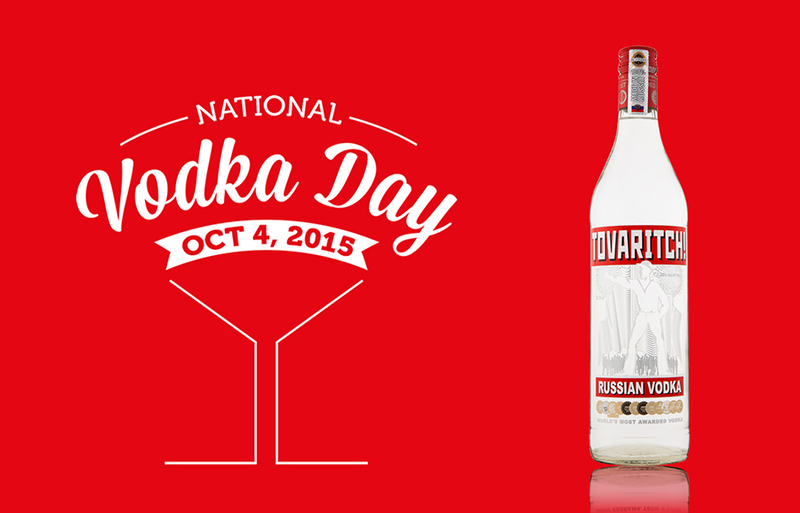 Let’s use this day to celebrate some of the best vodka around. For us, it’s the Tovaritch! Vodka, an authentic Russian vodka produced and bottled in vodka’s original homeland, St. Petersburg region. It’s National Stout Day on the 3rd October.. what a way to spend your Saturday sampling a variety of the world’s stouts. 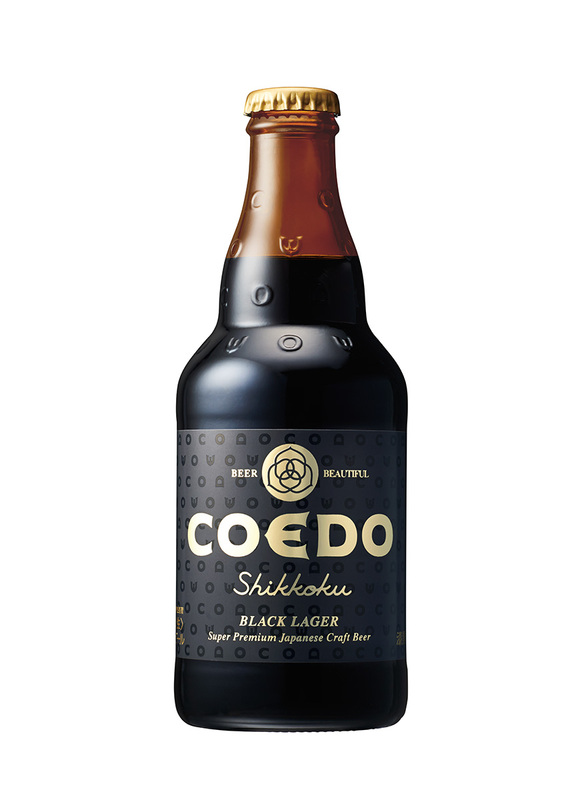 We recommend you try the Coedo Shikkoku, a black lager from Japan. Two types of black malt join six other malt varieties for a black lager that is smooth, light and well-balanced. Coedo proudly offers this dark jewel to stand among the best dark beers in the world. We will be celebrating National Champagne Week with our new range of Nicolo & Paradis champagne. Champagne Nicolo & Paradis is based in Arsonval (Aube Valley) and is produced by Agnès and David Nicolo. The vineyard is located in Colombé-le-sec and covers more than 17 hectares. The vines are predominantly Pinot Noir, but Chardonnay and Pinot Meunier vines are used for the blending process. The newly re-opened Regent Street Cinema is hosting a screening of the multi-award winning film Sideways on the 30th September 2015. 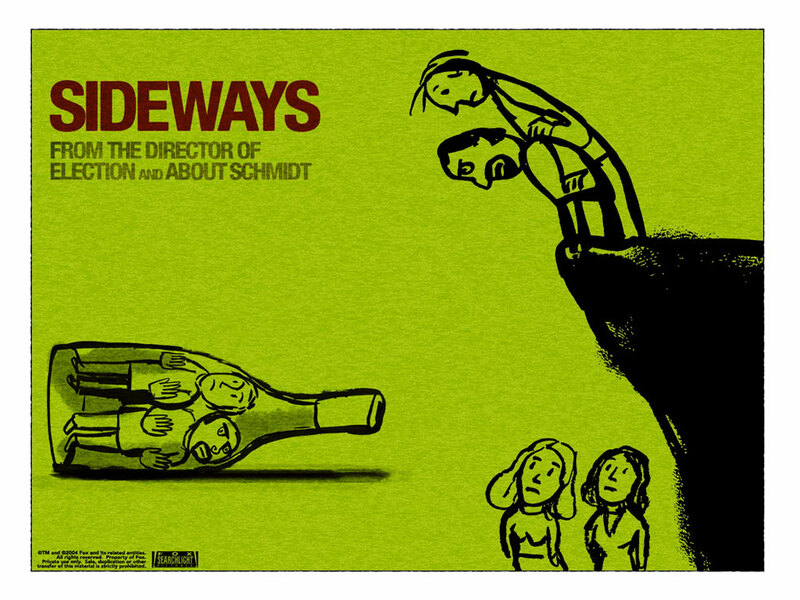 Sideways was a surprise box office hit in 2004, it told the story of two disillusioned forty-somethings on a wine infused road trip around California. Before the film, you will be given the opportunity to taste one of the latest releases from the Fess Parker winery (featured in the ‘spit bucket’ scene in the film). Our wine expert, Alex Down, will be serving a fresh and lively Pinot Noir, for you to try, which represents the Santa Barbara County wine scene that Sideways helped to make famous. 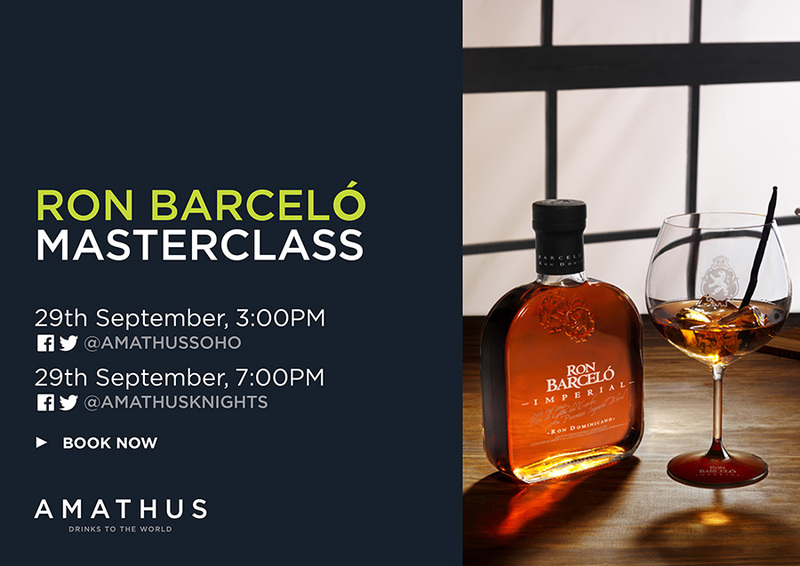 We invite you to join us for an evening of Ron Barceló masterclasses at our Soho and Knightsbridge stores on the 29th September. The masterclasses will be hosted by Maxim Boiko Savenko, Development Manager at Ron Barceló. 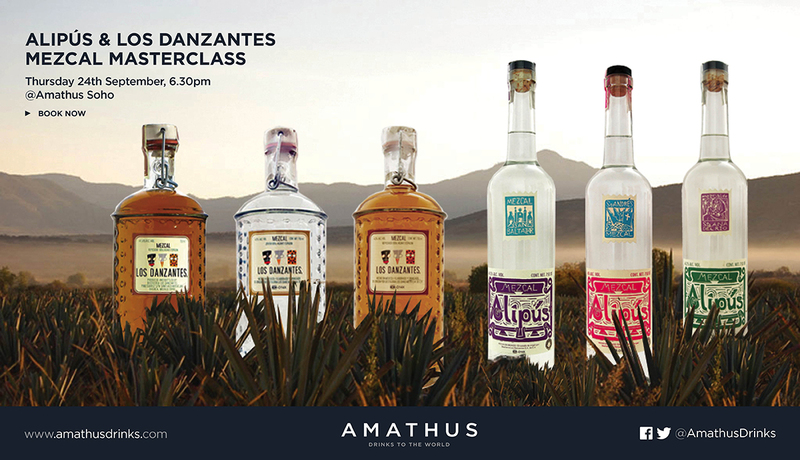 Join us for an Alipús & Los Danzantes Mezcal masterclass at our Soho store, hosted by Héctor Vásquez de Abarca, Marketing Manager of Mezcal Alipús and Mezcal Los Danzantes. Hector will also be hosting two pod tastings on Friday 25th September. They will take place at our Shoreditch store from 12.00pm and at Knightsbridge from 7.00pm. 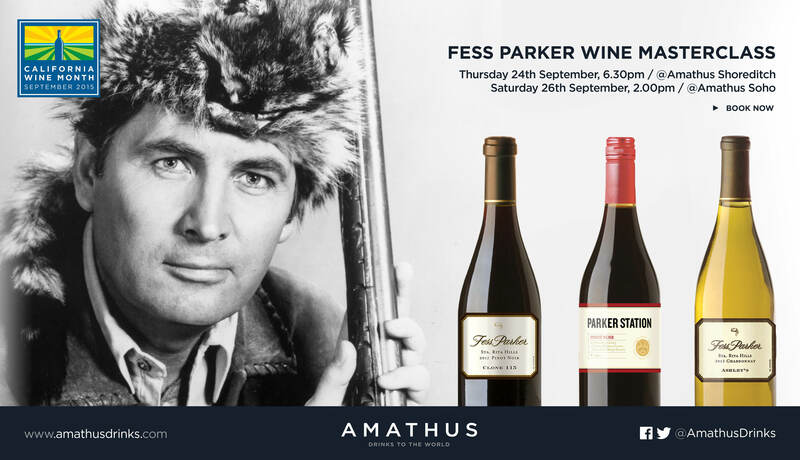 We will be opening our doors to Fess parker for an exclusive masterclass, hosted by Tim Snider, President of Fess Parker Winery. The focus of the masterclass will be on their fantastic Pinot Noirs, made famous by the ‘spit bucket’ scene in the 2004 award- winning film Sideways. The SITT is a critical tasting for both new and seasoned trade professionals, bringing you a wide selection of specialist importers, boutique wineries and agencies all showcasing a great range of wines. This year the SITT will be held at The Royal Horticultural Halls on Elverton Street. 22nd and 24th of September. It’s cocktail time! 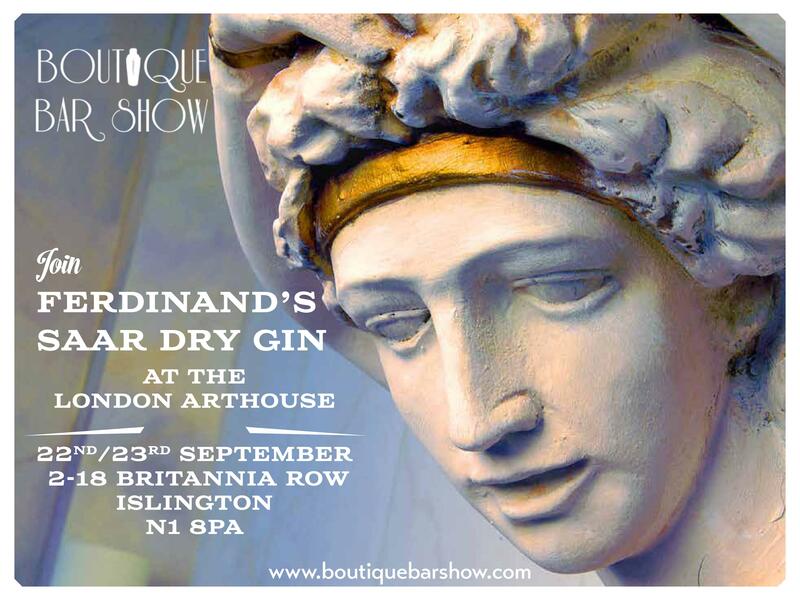 Please join us for a Ferdinand’s masterclass on the 21st Septemeber followed by a cocktail competition. It’s your chance to showcase your cocktail skills and win a trip to Ferdinand’s Distillery! It’s the Tequila & Mezcal Fest this weekend! Joining us there and also available to taste is Calle 23, Centinela and Cabrito tequilas, Del Maguey, Alipús and Los Danzantes mezcals as well as Zignum and Los Siete Misterio… make sure you pop by for a tasting.